Run, don’t walk! Nescafe Dolce Gusto capsules have been restocked at Coffee Cow. The high-pressure brewing and smart capsule technology of the Dolce Gusto system provides has become a favorite among Coffee Cow customers, which is why this restock couldn’t come soon enough. 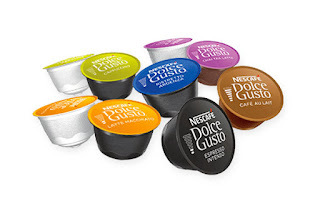 One of the most beloved brands in the business, Nescafe raised the bar with their Dolce Gusto selections and we proudly carry an assortment of their most popular capsules. At Coffee Cow, you will find espressos, macchiatos, cappuccinos, dark roasts, house blends, chai tea lattes, and so much more by browsing our collection collection. Whether you’re in the mood for an intense after dinner espresso like the Espresso Intenso Espresso Intenso, a refreshingly cold cappuccino like the Cappuccino Ice on a warm spring or summer day, or a decadent treat like the Caramel Latte Macchiato, Coffee Cow has all your Nescafe coffee cravings covered. Explore our selection of Nescafe Dolce Gusto capsules today – and quick, before they sell out again!